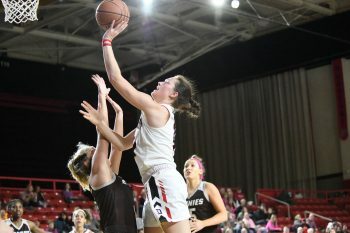 DAVIDSON, N.C. — Katie Turner scored a season-high 22 points and Davidson pulled away late from St. Bonaventure thanks to its free throw shooting in taking a 67-55 Atlantic 10 win Saturday afternoon as part of the Wildcats’ annual Play4Kay game inside John M. Belk Arena. Sarah Donavan goes up and over the defenders from St.. Bonaventure. 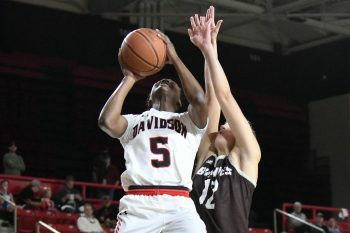 Davidson moved to 8-2 in league play and 14-9 overall, while SBU fell to 7-16 on the year and 4-6 in A-10 action. Thanks to an 11-for-14 shooting performance late in the fourth quarter at the charity stripe, the Wildcats were able to turn a 52-49 lead with five minutes to go into a 65-55 advantage and 25 ticks remaining. All but two of the points came at the free-throw line during the game-changing 13-6 run. Turner helped the Wildcats erase a four-point halftime deficit, 29-25, by scoring eight points and finished the second half with 12 overall. The sophomore finished the day shooting 7-of-11 from the floor, including 4-for-6 from three-land, and swished home all four free throws. Sarah Donovan recorded her team-leading ninth double-double on 10 points and 12 rebounds, while Justine Lyon dropped in 13 points off the bench. Justine Lyon was able to maneuvered around a St. Bonaventure player to take one to the basket. 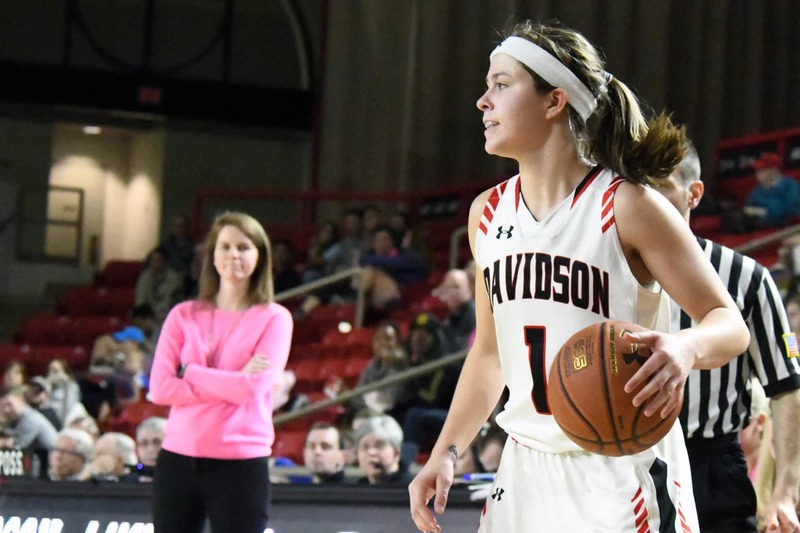 Cassidy Gould gave Davidson its fourth double-digit scorer with 11 points, all in the second half, and went a season-best 6-of-7 from the charity stripe. The freshman nailed a buzzer-beater to end the third quarter and gave Davidson a 44-43 lead. The Bonnies had two reach double figures, led by Danielle Migliore and Mckenna Maycock with 12 and 11 points, respectively. Davidson shot 44.2 percent and dished out 16 dimes on its 23 made field goals, while going 15-of-19 overall at the free-throw line. St. Bonaventure was held to 38.9 percent shooting, including just a 4-of-15 in the fourth quarter and only 1-for-7 from behind arc. 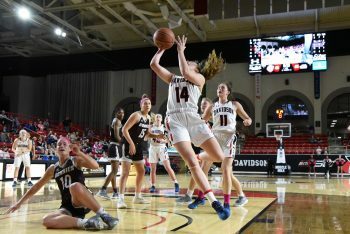 Davidson came out of the gates slow, falling behind 11-6 at the end of the first quarter and then trailed 17-6 to start the second quarter forcing it to burn a timeout. Cassidy Gould still managed to put the ball up after being fouled by a St. Bonaventure player. The deficit grew to 21-9 at the six-minute mark of the second quarter before the ‘Cats’ offense got going by running off a 14-5 run to close within 26-23 after a triple by Turner with 1:28 to go. Justine Lyon had seven points during the spurt and added two more on a jumper at the end of the quarter to close within four points at the half. Staying at home, Davidson will next host Fordham on Wednesday, Feb. 13 for a 7 p.m. A-10 game. GAME NOTES: This was the fifth meeting all-time between both team’s women’s basketball programs … the Wildcats improved to 2-3 in the series with its second straight win … the game featured eight lead changes, five of them came in the third quarter … Turner was one point off her career high … the 20-point outing was her third of the season and fifth of her career … Davidson improved to 8-2 at home … Donovan has 11 double-digit rebounding games this year and 16 for her career … she has double-figure rebounds in three of the last five games … Davidson was hosting its 10th annual Play4Kay game in awareness for breast cancer.